Excellent meeting with Sarah from “Sleeping Lion” and Rosie from “Rosie Duncan” this morning, both marketing experts, on how to expand the altruistic side of Betsie Valentine in to the world of corporate business. It was inspirational to say the very least. 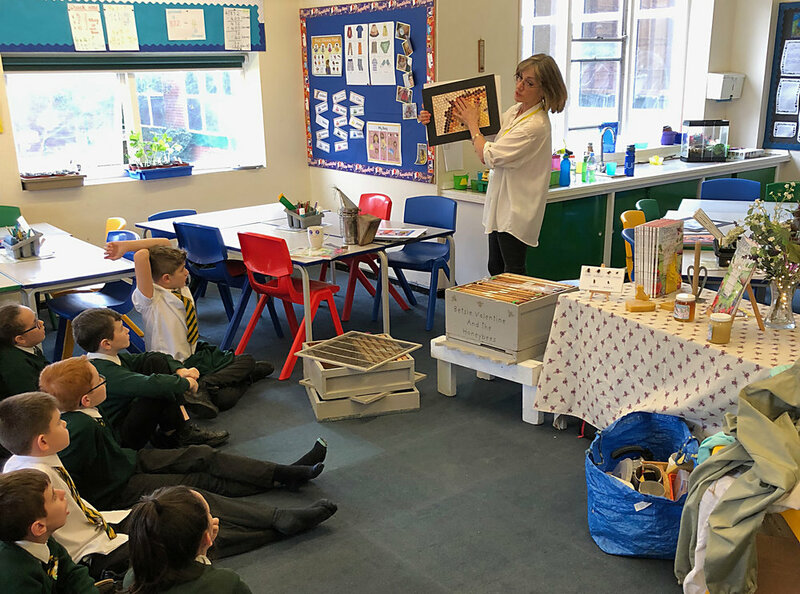 As you all know my passion is the Honeybees and I love nothing more than going in to schools and talking to children and their teachers about their importance to our planet and the lifecycle of the Honeybees. I also visit W.I’s, Libraries and local communities which I also enjoy doing with every beat of my heart. The more you learn about the Honeybees the more you learn about community, communication, leadership and so on. And so.. I am expanding my business in to going to small, large and corporate businesses to talk about the correlation between the success workings of a colony of bees and a successful corporate company and what we can all learn for the good of ourselves and our planet..
Why Bee-2-B? It’s my corporate calling card. Let’s get it out there and create a buzz! Yesterday the sun was shining and it was just above 16 degrees so I decided to go and have a look at the bees to see if the Bailey Comb Change had worked. I first checked the new brood box to make sure the queen was still there and laying and indeed she was. A wealth of brood on 4 frames and surrounded by her dutiful nurse bees-a-plenty. I very carefully lifted both the old brood box and new one together to one side, leaving the floor in its original place. I then placed the new brood box on top of the floor and popped the queen excluder on top just to make sure she didn’t fly off. I went through the old brood box to check that all the brood had been born and to make sure they hadn’t turned any of the eggs in to queen cells, which they can do, it happened to a couple of friends of mine. They went in to check their boxes and there was a queen in both! Fortunately that hadn’t happened to me, although not a complete disaster, you would just have to split the hives, but more hard work.. The picture below is of me shaking the bees from the old brood box in to the new one. Once that was done, I replaced the queen excluder and because of the amount of bees that would now be in the new brood box I popped a super with frames on the top to make sure they have enough space and are not tempted to swarm. So all in all that has been a perfect Bailey Comb Change and I could not be more thrilled to be starting the honeybee year with a strong colony of bees. When I’m at schools one of the most asked questions is “Do you get stung?” I always tell the children and anyone who asks the truth, the answer is very rarely. Honeybees do not like to sting you because they die. If you go to my Betsie Valentine Facebook page, https://www.facebook.com/betsievalentine/videos/577337936109096/?modal=admin_todo_tour you can see the video of me shaking the bees from one box to another and you can hear and see the amount of bees that were flying around. Of course they weren’t happy, I was completely disrupting their hives BUT I did not get stung, not once, during the whole procedure so I think this answers the question very well don’t you? 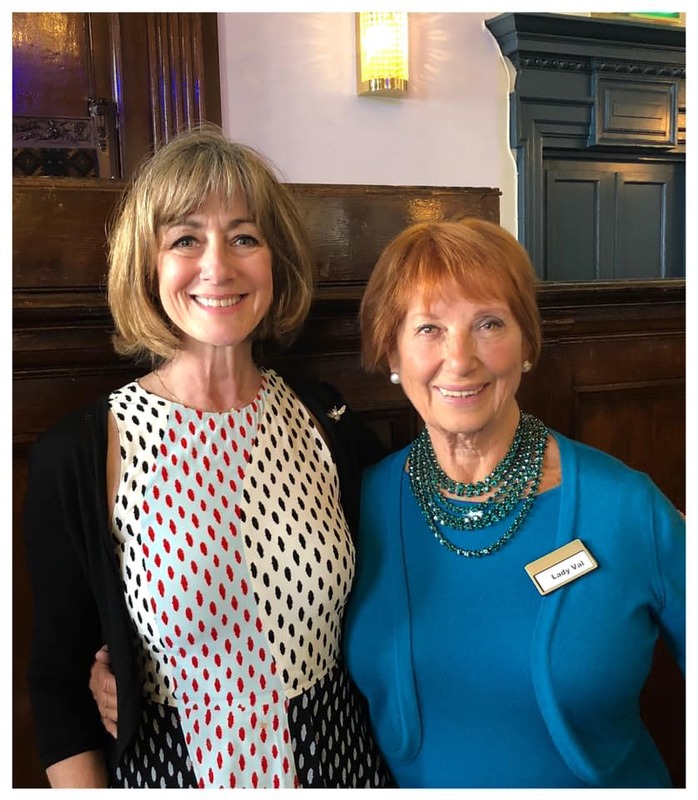 I am delighted to have been asked to go on Mimi Harker’s radio show for Wycombe Sound 106 fm. I am going in on Good Friday to record the show and it will be aired on Easter Sunday between 12:00 and 1:00 on “Mimi Meets” She has asked me to choose three records that mean something to me, so if you want to find out what they are and why do tune in and listen! 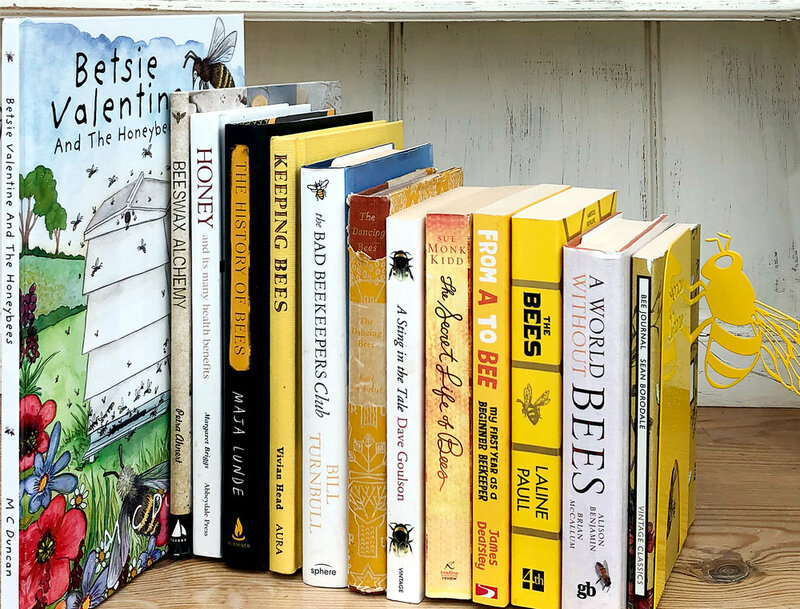 We will also, of course, be talking all things Honeybees and Betsie Valentine. So another busy week comes to a close. Hopefully next week a new colony of bees will be arriving to joint my other hive and the season can really get going as the weather gets warmer. Meanwhile, enjoy your weekend. THE QUEEN IS ALIVE AND WELL..
Not exactly inspecting my bees, but since doing the bailey combe change, I am up there every day feeding them. However, no matter how much I have tried to get my friends words out of my head, that I had done the bailey comb change too early and the bees would abandon the Queen and go down to tend the brood in the box below, I was having this repeated vision of my abandoned queen laying frozen and alone in the new brood box having died a slow and dismal death…GOOD LORD! So…. I took a sneaky look inside… naughty I know., but this time the temperature was over 18 degrees, the sun was shining and the bees were out in force. A quick lift of the lid revealed hundreds of bees busy in the new brood box. Hoorah! Now I can relax for the next couple of weeks until I remove the old brood box from underneath and shake in the whatever bees remain down there in to the new one. A few more pictures can be seen on my blog.. of the bees bringing in the goods. It was like a busy day on the runway at Heathrow! I thought the honeybee in the last image, bringing home pollen, had rather a smug expression on her face! I am delighted to have now heard from the gentleman with the colonies he has to re-home and I should have one those by the weekend which is very exciting. And, looking at the strength of the colony in the new brood box, once joined with the old brood box lot.. I am thinking I am going to have a superbly strong colony for the wonderful April and May blossoms that are just coming out. Talking of which, I was out on my horse at the weekend and the Hawthorne is coming in to full bloom and beginning, from a distance, to look like the branches of the trees are covered with a light dusting of snow. It’s lovely, especially with the sun shining up against a beautiful blue sky. Lots more photographs to be taken. I can feel my shutter finger twitching at the thought! I am, as most of you will know already, a photographer. I have just this moment returned from a talk at a lovely school. The Oaks, Primary Referral Unit in Amersham. It is a school that provides support for children experiencing significant social, emotional or behavioural difficulties in their mainstream primary school. I came home buzzing. These lovely children who, for whatever reason, have been excluded for a period of time from the main stream schooling system, really enjoyed the talk, and engaged with me. Their keenness to answer questions and be involved with the talk and of course ask questions at the end was fantastic. The Head of House said it was “spot on.” All of which nicely leads on to this weeks unanswerable question….. “What do the letters WBC stand for?” I should have known this.. well I do now. It is named after its inventor - William Broughton Carr - (note the initials) - who first published details of this hive in 1890. Voila! To be fair I had guessed that they were the initials of the inventor I just didn’t know the name. That’s my excuse and I am sticking to it. Enjoy the images of the bees bringing in the pollen! Note to self: Take proper camera up to the bees then I will capture better quality images..
BAILEY COMB CHANGE DONE AND EXPLAINED! So happy to have managed to perform a bailey comb change this afternoon on my hive. It was the first time since I started beekeeping that I only had one hive to go through the winter which is always precarious but I took the decision to unite two fairly weak hives to make one strong one to take through the winter. It, so far, has paid off and today I did my first proper inspection and saw the Queen, she’s nice and big and has started laying like crazy. The frames she is on are not very clean so I decided to get her on to fresh comb asap. You need to get your hive of bees on to fresh comb to start the season, hopefully disease free and healthy. Below is an explanation of how to perform a bailey comb change and if you would like to see the video visit the Betsie Valentine FaceBook page. It’s a tad garbled but having read my explanation below you will understand a bit more. 1. Place a new brood box on a crown board next to the old one. 2. Take out a frame from the middle of the new brood box. 3. 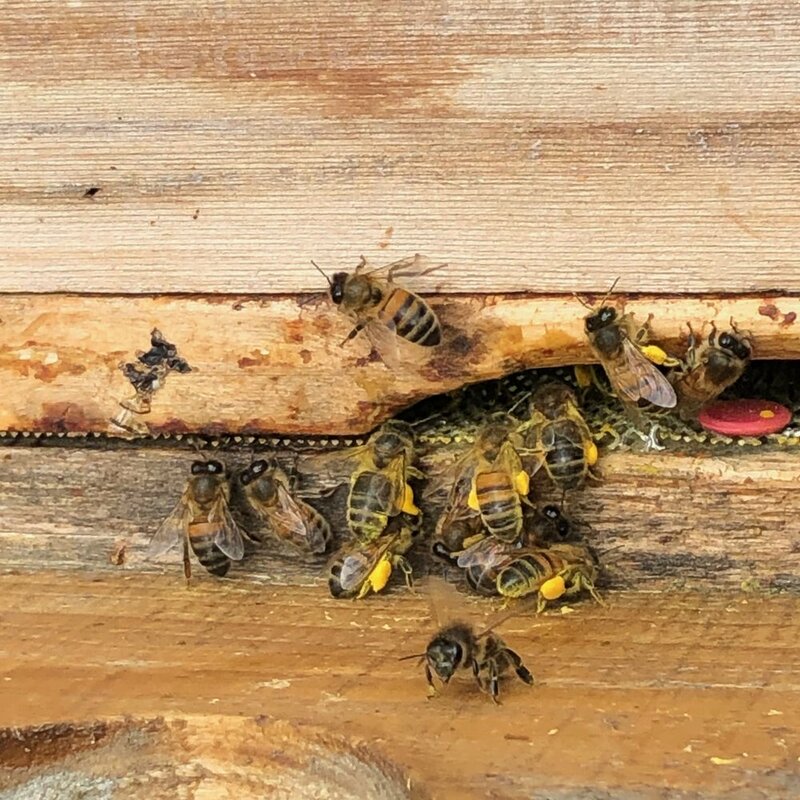 Very carefully look through the old brood box until you find the queen on a frame with some brood and gently lift it over and place in the new brood box and pop a queen excluder on the top to stop her escaping. 4. 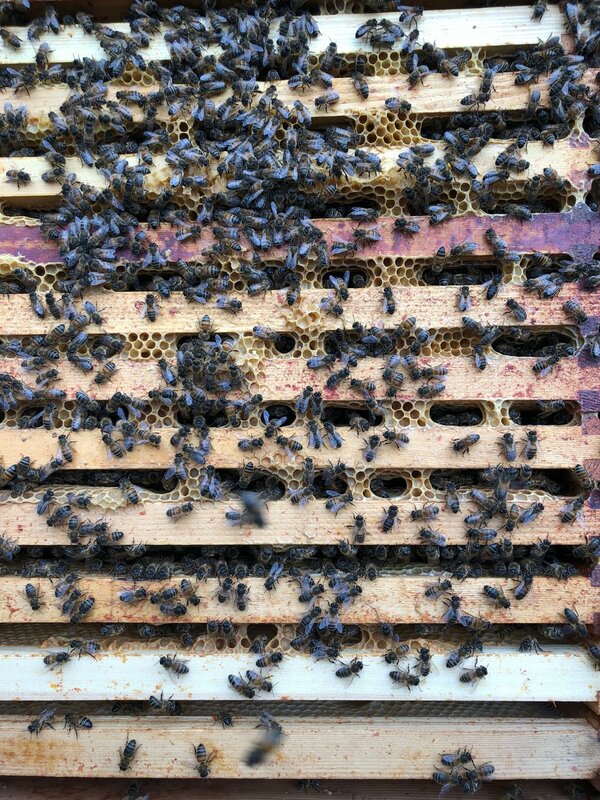 What you have now is the queen in the new brood box surrounded by fresh un-pulled comb with some nurse bees and attendants with her. 6. Take the queen excluder off the top of the new brood box and place it on top of the old brood box. 7. Gently lift the new brood box on top of the old one and quickly put the crown board on top to ensure she cannot fly off. 8. You now have the queen on top of the old brood box - separated by a queen excluder so she cannot go down into the old box and she will have to start laying in the top. 9. Put an empty super on top of the crown board and then place a feeder on top of one of the holes and fill with sugar syrup. Cover and put the lid on top. 10. What will happen now is the nurse bees will stay in the old brood box and look after the brood. As and when they are born they will all move up to be with the queen. 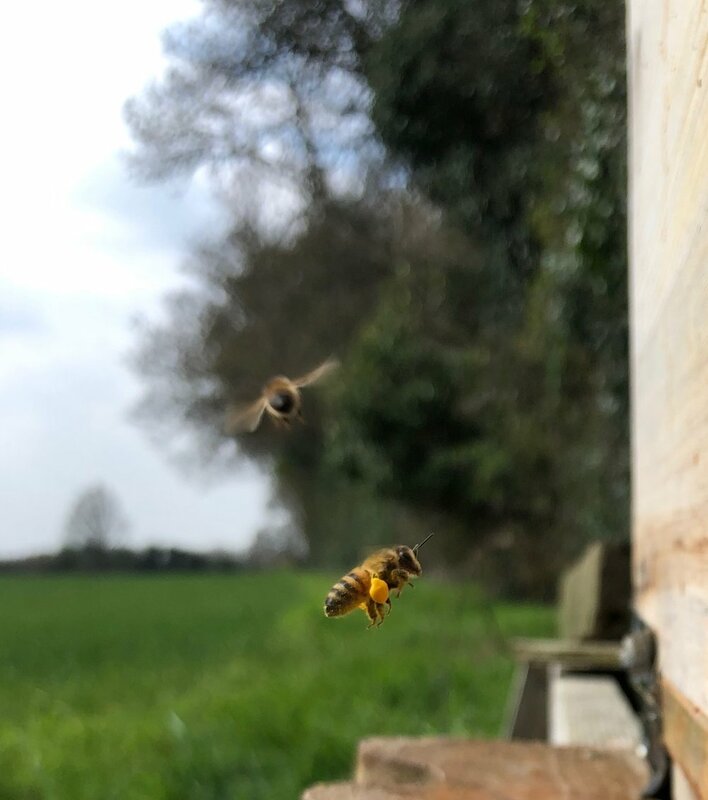 Meanwhile the flying bees will come in with their goodies and take it straight up to the new brood box and with the help of the sugar syrup which will give them more energy they will start to pull out the fresh comb for the queen to begin laying in. 11. In about three weeks time, when all the brood has been born and they have gone up to be with the queen remove the old brood box. Any bees that remain in there shake in to the new brood box and - voila - you have performed a bailey comb exchange! Today I was at Chalfont Valley E-Act Primary School. There were between 70 and 80 children. And as always, these blog posts are repetitive because the children are always great! This was a lively lot but their energy and enthusiasm was superb. Once again great questions asked and then came the one question of the day that I can never answer, there is always one! Great question. I did not know the answer but suggested they go back to class and figure it out based on the honeybee, in the height of summer, only living for 6 weeks and only 2 of those weeks she is a flying bee. As I was packing up to go a very bright lad came back with the answer written on his hand. His name is Shiva and he had calculated it to be approximately 217,7289,000. I will take his word for it! 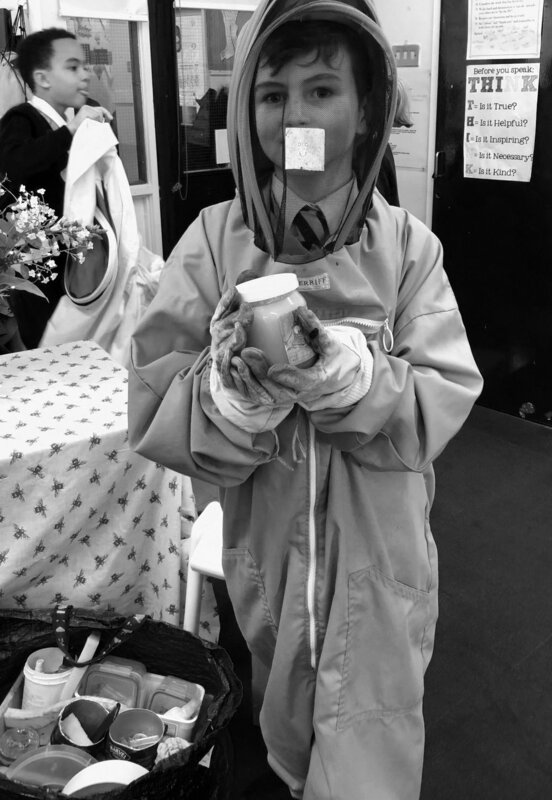 … this lovely girl from Bedgrove Junior School. After my honeybee talks, at each school, I hand out a picture of the Queen Bee, to those who want to colour it in and enter it for a competition to win a signed softcover copy of Betsie Valentine And The Honeybees. The smile says it all.. I spent a lovely afternoon with a class of children at The Waterside Academy in Chesham. I was there for about an hour and half talking to them about the honeybees, showing them how the hive is made up and throwing various facts at them. I then asked them questions to see how much they had taken in and opened it up to a question and answer session for them. They really did ask me some great questions. One child asked me if the worker bee could lay eggs. Good Question. Another asked me why there wasn’t a King bee. Good Question. 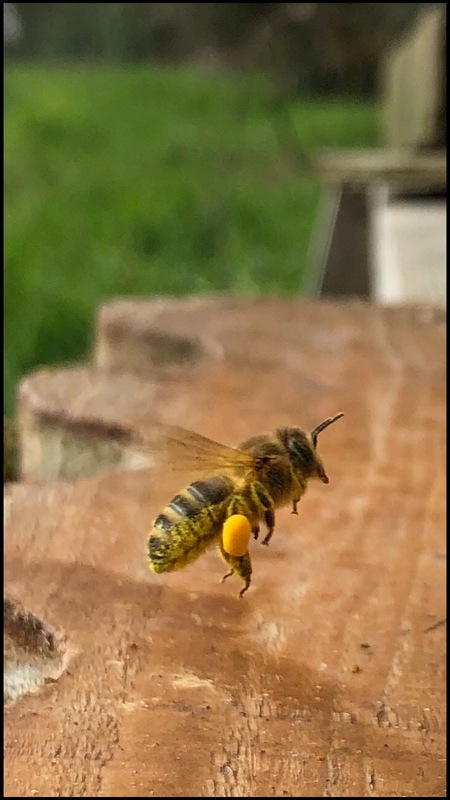 And finally, there is always one that stumps me and this time it was “Is the honeybee related to the wasp?” Once again, I thought I knew the answer but erred on the safe side and said I would google the answer when I got home and send it to them, which I did. The answer is in fact as follows: It’s thought that bees originally evolved from hunting wasps which acquired a taste for nectar and decided to become vegetarians. Fossil evidence is sparse but bees probably appeared on the planet about the same time as flowering plants in the Cretaceous period 146 to 74 million years ago! After the session the children came up and tried on the bee suits, looked through the virtual hive and continued to fire questions about the honeybees at me. Boom! Finally those that wanted to - took home with them images of the Queen Bee to colour in and send to me. I will choose the winning picture and the child will receive a signed soft cover book. Below are some images taken of during the course of the afternoon. Yesterday I went to The London Book Fair. It was an interesting and exhausting day. These things always are, endlessly walking round in circles looking for a stand number that bares little or no resemblance to any of the stands nearby. In a somewhat obscure way this advice did come from the Publisher I spoke to. But it was something I took from his negativity. He held Betsie Valentine in amongst the children’s books he publishes and said.. ”You see it’s the wrong size. It doesn’t fit with all the other books.” He then went on to say “…and when you open it up, it isn’t what you expected.” I listened patiently, because he was good enough to fit me in to his genuinely extremely busy day and I nodded my head accordingly. But my brain thinking.. and your point is? So Betsie Valentine And The Honeybees isn’t the correct size. No-one expects a story book to be A4 in size. Because of it’s size people are expecting a picture book and what they get is a story with beautiful pictures.